I have an application that requires a set of search results to be flagged if the user selects a checkbox in front of the each search result item. I use an each() loop to set the flag of each search result item via an AJAX call. 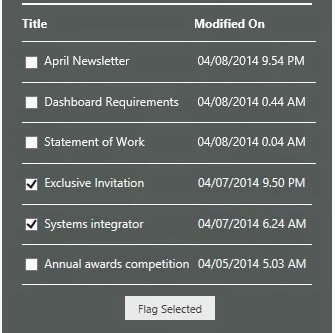 Then there is another requirement to show all flagged items in a different panel. So I wanted to run a function after above jQuery .each() is done. That is after finishing all the Ajax requests in the each() loop. // code to be executed after four ajax requests complete. But in my case, since the number of selection is not the same always, approach to be used is bit different. Actually I have to pass an array of arguments (deferred objects). So we can use .apply, which makes it possible to call a function with an array of arguments. For that I declared an array for deferred objects. Then pass it to the function where each Ajax call is happening. // Declare an array of Deferred objects. // Stop following not selected documents. Then in the followDocument() function (where Ajax call is), I push the request object to the deferred objects array. // Make the current user start following a document. When all the objects in the deferred array are resolved, call getMyFollowedDocuments() function which will refresh all flagged items tab. // Refresh my flagged items tab.